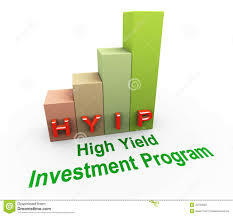 Primary objective of this article is to Analysis High Yield Investment Programs. All of the owners of High Yield Investment Programs use the money they receive to deposit in shares, stock market, property, forex and several money earning programs. On the profit they are making they furnish their members the stated incentives. The best strategy for getting money is to borrow. Banks are a risk since they have high interest, so in return they become the banks and gives members different plans of payment based on their amount deposited. They generally have a multitude of plans that are provided to its members.